Bhutanese Prime Minister Lotay Tshering who is on a whirlwind visit to Bangladesh has asked Bangladesh to do business to take the relations between the two countries to a new high. Lotay Tshering, who holds a special place for Bangladesh as an alumnus of Mymensingh Medical College, was quoted as saying that everybody knows ‘we are landlocked but we are not mind blocked. We are open to business’. Tshering was speaking to business leaders in Dhaka on his arrival on a four-day official visit, his first since he took office on November 7 last year. Bhutan was the first country to recognize Bangladesh in 1971 during the war of independence that makes the relations very close. 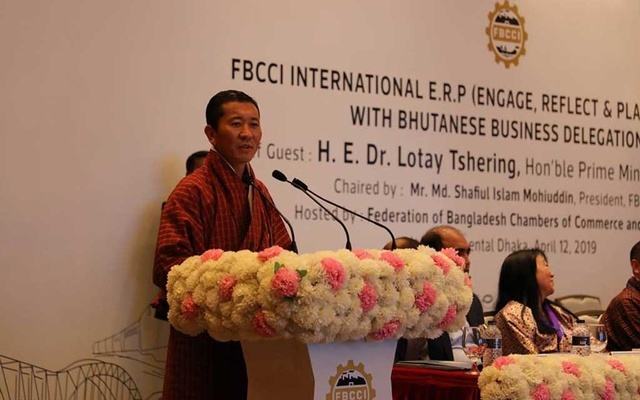 The Federation of Bangladesh Chambers of Commerce and Industry (FBCCI) organized the Bhutanese business dialogue where Prime Minister Tshering was the key speaker. Bangladesh expects to sign five MoUs with Bhutan during Tshering’s visit, according to reports. The Bhutanese prime minister, however, said MoU is not enough ‘if there is no follow-up action, if there is no commitment’. Tshering added that people talk about PPP model which is public private partnership. ‘To me it means positive people-to-people contact,’ he was quoted as saying. Bhutan has 30,000 MW capacity of hydro-power. Currently it is producing 5,000 MW. Bangladesh is keen to invest in Bhutanese hydro-power. The Bhutanese Prime Minister also praised India for hugely investing in Bhutan in many areas.